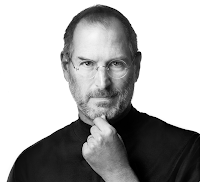 Steve Jobs died today, at just 56 years old. Steve Jobs made tech cool. He made technology fun and exciting. He said he wanted to change the world, and he did. He designed the best computers, again and again, for the past 30 years. I wish he'd stayed around a while longer. This post was written on a Mac, as was every other blog entry I've written. So is this response. Hopefully he put things in motion and the pace will continue unabated.